There is a long pause when Shanika Edwards is asked whether she believes her son Ames, who disappeared when just a baby 15 years ago, is still alive. "I have mixed feelings," she finally says. "Sometimes I think if he is alive he would have been found by now. "But other times I think maybe whoever did it obviously concealed it so well they managed to get away with it." 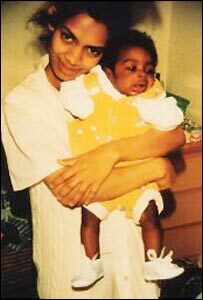 Shanika was a young mother of 22 when five-month-old Ames, her first child, went missing from west London on 5 February 1990. He had been staying with his father, Paul, from whom Shanika had been living apart. Her first inkling that anything was wrong came in a phone call from her husband. Paul told her that he had left Ames alone in his car while he went to use a cash machine and get a takeaway and that when he returned the baby had disappeared. Afterwards, Shanika recalls, she ran in panic to a nearby police station. Her worst fears were realised when officers told her that a baby had indeed been reported missing. "So it was obviously real but to me it wasn't real at that time. I thought this can't be true. I thought this is just not right." Ames' case came just a month after that of Alexandra Griffiths, a newborn snatched from a London hospital by a woman posing as a health worker. Alexandra's case came to a happy conclusion - she was reunited with her parents two weeks after being taken - but that of Ames Glover has dragged on to become the UK's longest-running abduction investigation. At the time Ames disappeared there were criticisms of police handling of the case with accusations their behaviour had hindered progress in the investigation. Both Ames' parents were questioned for many hours and information about family problems and the baby having been on an "at risk" register was passed by police to the media. At one time, Shanika says, she was extremely unhappy about the way the police had dealt with the case. 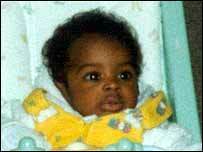 But her feeling have changed since the case was taken on by Scotland Yard's Racial and Violent Crimes Taskforce in 2002. "To be honest looking back now I think they did everything possible at the time. But they didn't share everything they did on the investigation with me and I felt they had not done enough. "But now they have taken me through everything I think they did everything they could the first time around," she says. Shanika says it is a long shot that Ames will ever be found but has taken hope from that fact that previous appeals have led to leads, such as a tip-off in 2003 that Ames had been taken to Ghana. "I was quite excited then because I felt maybe there must be something there. So I did have a little bit of hope but I had to accept reality that nothing came from it. "But having said that it's not completely dismissed, the police will go back to Ghana if anything comes up," she says. Shanika and Paul, who had been having marriage problems, split up for good shortly after Ames' disappearance. "It's still raw. I just feel very bitter and angry that nobody knows what happened to Ames. "So many years have gone by and now, good or bad, I'd just really like to know what happened so that I can close that chapter of my life," she says.